Posted on October 23, 2014 at 11:47 am. Yoga demands discriminative awareness. We ask ourselves when to take action, when to exercise will, when to surrender. We learn from the seasons and the squirrels – now is the time to store nuts, to get ready, to gather. As a new Board we are gathering financial advice and organizational options. Just like the transitional Temple, interim solutions arise as we advance forward. Drawing from the past, we revisit Swami Radha’s words, knowing we have the foundation. Keeping the centre, we move ahead step-by-step. Calling out, we listen to what echoes back. Who shows up? Following leads, we are detectives of divine mysteries.The transitional Temple is a perfect symbol. Those with skills come and do the job, inviting us all to be part of creation. Beauty and limitations arise. This isn’t “it,” but it’s perfect for now. We are in the now – looking ahead, looking back. We are in the Light with deepest gratitude for this time of hope, change and encouragement! One-Month Young Adult (18-30) and Karma Yoga (30+) Programs: These one-month Service & Study Programs are for those who are interested in experiencing life in a spiritual community, developing skills and studying yoga. 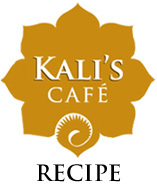 They are live and work programs, with a focus on the practice of Karma Yoga or selfless service. Starting November 3 and December 1 Yoga & Healing Retreat: Yoga offers many spiritual gifts to access health and wholeness. The retreat is for those seeking physical, mental or spiritual healing. Spacious and nurturing, this is a time to go inward, accessing your compassion and inner Light. December 5-7Renewing in the Light Retreat (Winter Solstice): Bring Light into deepest darkness and prepare for awareness to expand. In this retreat we explore the practice of the Divine Light Invocation, along with relaxation techniques, visualizations and meditations on Light. December 19-21Yoga Development Course: The YDC is an intensive three-month program designed to give students an in-depth introduction to the major branches of yoga and a foundation in personal and spiritual development. The course is of lasting value to those who wish to deepen their yoga practice and make permanent changes in their approach to life. It is the prerequisite for our teacher training. January 8-April 8, 2015Personal Retreats and Artist and Professional Renewal Retreats are available year-round at the Ashram – take time to renew spiritually and creatively. Download the 2015 Program Calendar (PDF). You can also view the complete satsang. 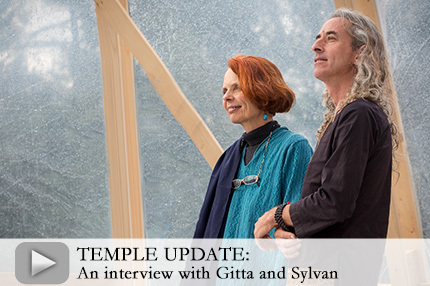 In October karma yogis and Ashram residents co-created the transitional Temple with a pair of local builders, Gitta Ridder and Sylvan Dempster. Not satisfied with straw and tarps to cover the foundation over winter, they generated the idea of a wooden dome covered in plastic that would protect the base and later could be moved and transformed to a greenhouse. During the building process, Gitta and Sylvan reflected on their interest in being involved. View their on-site video interview. Time-lapse photography captures the construction in a three-minute video. By October 31, we will receive proposals from architects and design concepts from students at the University of British Columbia for the new Temple. We plan to make decisions in November on how to move forward, have the winter to collaborate on design, and start building in 2015. Swami Samayananda is planting 108 bulbs, Eva Snyder is pulling 108 invasive weeds per week, Amy Allcock is taking 108 photos of leaves, Lorraine Burke is offering 108 Ganesh dances, Swami Lalitananda is tweeting 108 times, and Karin Scarth is creating 108 Star Yantras. These are only a few of the activities taking place in support of the Yasodhara 108 fundraising program – an opportunity to raise money for the Ashram’s Young Adult program and to explore individual creativity. With ten days to go, forty-two participants and 286 donors have raised over $15,000 – thank you to all who have contributed. Help us reach our $40,000 goal by registering now to fundraise on the Yasodhara 108 website. Or donate to your favourite Yasodhara 108 participant or make a general donation to Yasodhara 108. You can make a difference in the lives of young adults who sincerely want to bring out the best in themselves and offer the best back to the world. For more information contact the Yasodhara 108 team. 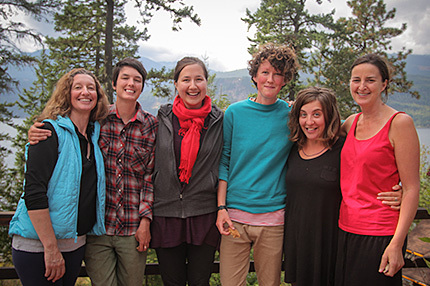 Internships at Yasodhara Ashram are spiritual and career/life development opportunities. This year the program expanded to include positions in accommodations, garden/orchard, grounds and kitchen/preserving kitchen. Molly Askey-Goldsbury of England liked balancing two internships – garden and kitchen – during her seven-month stay. Her study focus in the kitchen was sourdough culture and artisanal methods of breadmaking. Her garden study project was seed saving. We are grateful for the enthusiasm of Molly and the other interns, and appreciate the learning they shared in their presentations so far: Bryn Bamber – leadership (garden); Penelope Griggs – sugar-reduced jamming (preserving kitchen) and inventory systems (accommodations); Rachelle Premack – chickens (garden). More to come! Curious about an internship at the Ashram? See what the current opportunities are. Take a look at the many offerings available in our 2015 program, including our popular Signature Courses (5-day combinations of Swami Radha’s original workshops) and core programs (such as 10 Days of Yoga and Stilling the Mind Retreat). Responding to demand, we are again presenting Family Week, Living the Practice with Swami Radhananda, Light and Vibration with Swami Lalitananda, as well as experimenting with courses that address contemporary issues such as Conscious Aging, Ethics in Yoga and the Unplug Retreat. Programs will soon be posted on the webiste where you can register online. In the meantime, you can download the 2015 Program Calendar (PDF). We look forward to seeing you here in 2015! 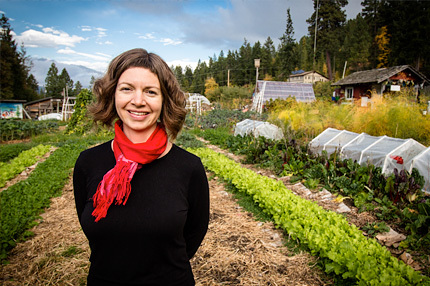 Paris Marshall Smith, Ashram Board member and Food Flow manager, attended the Canadian Rural Revitalization Foundation conference in Prince George on September 25-27. 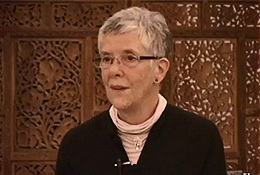 She represented both the Eastshore of Kootenay Lake and Yasodhara Ashram and returned with a deepened confidence about our direction. Conversations and presentations at the conference validated that the Ashram is on the right track. The theme, New Relationships, New Realities, brought out the value of being small, different and friendly. We fit all three criteria: being small, we are nimble. Being different means we recognize our unique place in the world and provide an authentic experience. Being friendly speaks to the Ashram’s emphasis on communication, relationship and being human. A question posed by rural representatives from around the country is one that we continually explore at both the Yasodhara Board level and day-to-day: What is our role and how do we best serve? I liked that a key point is the importance of identifying what we do well and then providing it authentically. This resonated with many of us from small communities working with diverse tourist-based economies. Columbia Basin Trust generously provided a grant, making it possible for me to attend this conference with 125 people from across Canada. It was a great experience. 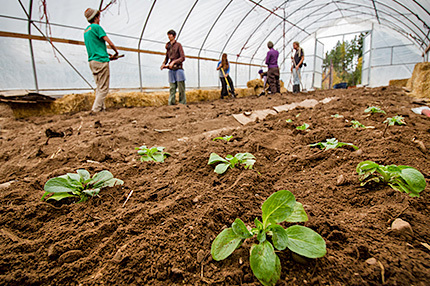 Yasodhara Ashram’s hoophouse has expanded. Improvements will allow us to grow greens ten months of the year, greatly reducing our dependence on external sources. The 6-by-15-metre hoophouse now sits on extended railway tracks that will readily move it over three zones. Terracing on one side leveled the ground and opened more soil to be worked. In follow-up work bees, karma yogis enclosed the edges with hay, picked rocks, formed beds and planted seeds. They also nurtured 800 kale plants outdoors that can be picked throughout the winter. The innovations come in response to the California drought, which may lead to shortages and price increases of softer greens. For example the cost of kale doubled last year. Read more about our sustainability initiatives. Two local meditation groups reflect on what makes Yasodhara Ashram a sacred meeting ground for their Christian traditions. 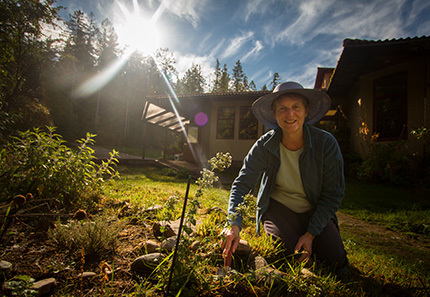 “Our little group enjoys coming to Yasodhara Ashram for a day’s retreat because it is such a welcoming, healing place. The deep sense of the sacred is powerful no matter what your faith background,” comments Martha Fish of the Trail Christian Meditation Group. The group visits annually, meditating in the Beach Prayer Room, enjoying lunch then visiting the bookstore. 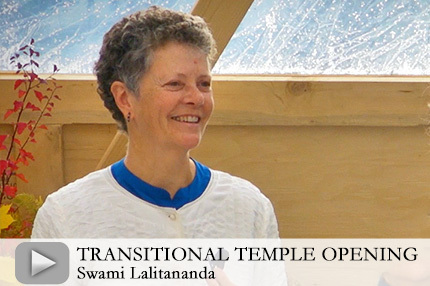 “Several members have taken courses at the Ashram and we see it as a wonderful asset to the spiritual life of the Kootenays.” This group was among the first to send a donation to the Temple of Light following the June fire. Much to Celebrate – Thanksgiving was heartfelt this year as we gathered for the first time in the new transitional Temple. Decked with colorful autumn leaves and garden squash, the structure – so recently created from elegant wood arches and recycled plastic – was radiant with sunshine and the brilliance of Divine Light. Residents, guests, builders and neighbours were delighted to be within this shimmering translucent shell holding the energy of the original Temple and the visioning/dream space for the Temple-to-be.Honoring 25 Years in Spokane – Yasodhara Yoga Spokane’s 25th Anniversary Open House drew in many current and former students, neighbours and the curious. “It meant so much to me to have people come into this Centre that holds the power of the Light and the mantras,” reflected Swami Yasodhananda. 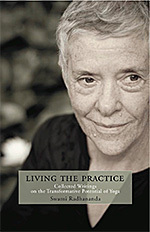 “It is a way to plant seeds for the future.” Swami Radha lived in Spokane in the final years of her life. 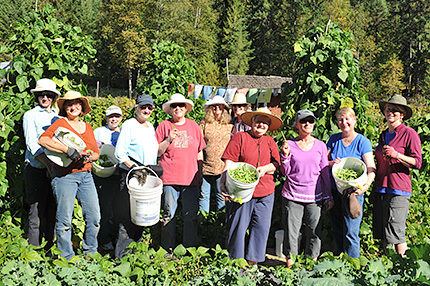 See photos of the celebration.An agricultural partnership – On October 19, Yasodhara Ashram hosted the Young Agrarians network for an agriculture-focused Taste of the Ashram. The day included Karma Yoga in our garden, discussions about sustainable food supply, a tour, reflection and a Hidden Language class. One of the Young Agrarian coordinators described the day as hopeful and restorative.Yoga Development Course 2015 – A diverse group is shaping up to participate in the 2015 Yoga Development Course. Nicole St. Arnaud of Calgary looks forward to her time. “I have wanted to do the YDC since first visiting the Ashram in 2006. The stars have all aligned and my divine appointment has finally come. My husband is very supportive and my employer has granted a leave of absence with encouragement. I am looking forward to this space to reflect on my life path, and to nurture my body and spirit in preparation for future endeavors.”Contact us for more information or to register if you would like to join Nicole and others on this journey of spiritual enquiry. In this video from Thanksgiving 2008, Swami Radhananda explores how to cultivate gratitude, its healing properties and the sweet “nectar and ambrosia” quality of it. She includes a beautiful visualization to invite in this most important finer feeling. Swami Radha’s message in this audio excerpt is that devotion and giving from the heart lead us naturally to humility and the joy of giving. Reflection QuestionsOctober is a golden month at the Ashram, with autumn hues enriching leaves and sky. And what is more golden and precious than gratitude? “Humility and gratitude go hand in hand. The feeling of gratitude is an interaction between the mind and the body.” (Swami Radha, Kundalini Yoga for the West) When you wake up, pause before arising and think of one thing you are deeply grateful for. Bring this gratitude into your day in various ways. For example, place a flower on your altar, open doors for people if you are out in public, wrap people in Light as you pass them on the street or at work. Reflect about your experience. Repeat the exercise. Commit to a set number of Divine Light Invocations daily. Reflect on the words: “Express your gratitude with deep feeling.” How do you do that in your daily life? Dance your offering of gratitude with these lines from the Ashram Prayer Dance: “Picking up the basket of flowers, I offer the petals in all directions. Each flower is symbolic of my devotion and God is everywhere. Placing down the basket of flowers, again I pray, please accept my offering.” Practice this as a daily offering and reflect on what it means to you. Or develop your own short dance as an offering of gratitude. “Don’t concentrate on what you have to complain about, what’s not one hundred percent according to your hopes and expectations. Look at what you already have. Concentrate on that.” (Swami Radha, Time to Be Holy) Sit quietly with your eyes closed and visualize a flower garden. Draw what you visualized. Write on your drawing (e.g. on a petal) what you grateful for. Add to your flower garden of gratitude when other feelings of gratitude come to mind.